The new Roubaix features groundbreaking technology wrapped in a sleek little package that would slip unnoticed past the untrained eye. 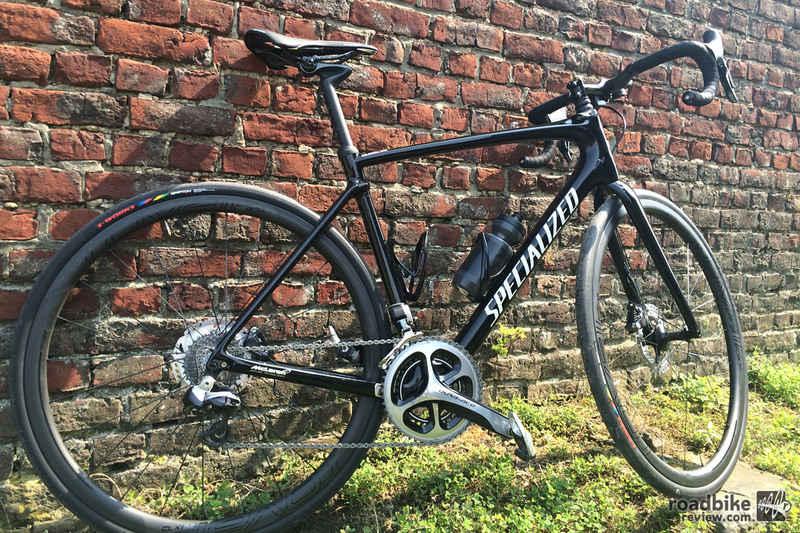 The newest iteration of the Specialized Roubaix is a game changer. It’s the lightest frame that Specialized has ever built, an unexpected title for a bike built to perform on the rugged terrain after which it was named. It also features a groundbreaking vibration damping system that is all but guaranteed to make big waves as it rolls onto the international market this fall. And as you’d expect from any new Specialized product, the bike features an improved aerodynamic profile over previous generations. 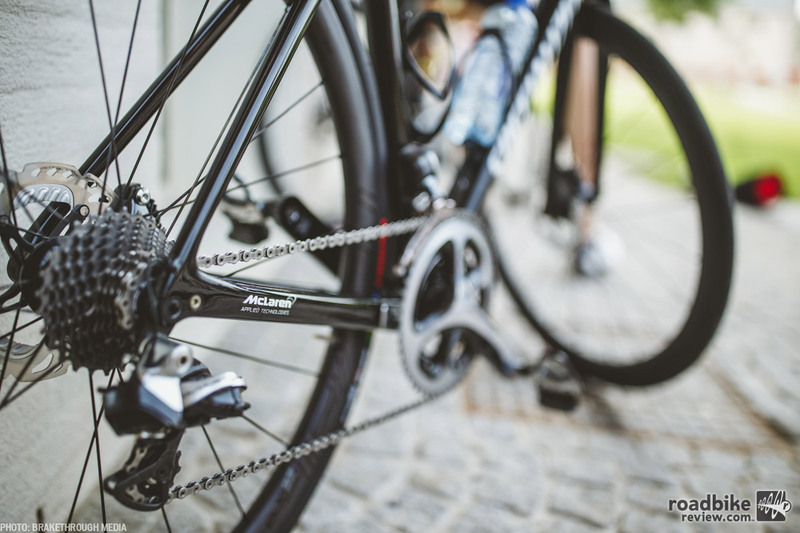 Developed in close collaboration with McLaren Applied Technologies, the new Roubaix lays claim to some lofty performance advantages over the many other “endurance” category road bikes on the market. Check out this video from Specialized and then read our full review to find out more. Gathered around the dinner table one evening in Kortrijk, Belgium, Duncan Bradley engaged us in a bit of philosophical conversation that was perfectly astute considering that which had brought this rag-tag assortment of cyclists to the table. Bradley is the head of high-performance design at McLaren Applied Technologies, a brand which made its name in the performance auto industry and Formula 1 racing. Lately, McLaren has been applying the same principles of high tech, data-driven design to a host of different industries, including cycling. Their unique partnership with Specialized was what brought us together on this particular evening. We were here for the unveiling of Specialized’s newest offering, the entirely revamped 2017 Roubaix. This iconic design, the arguable leader of the “endurance” category, already breaks the mold on what a road race bike should look like. It’s been scoffed at for it’s relaxed geometry. It’s been burned at the stake for it’s innovative vibration damping features. 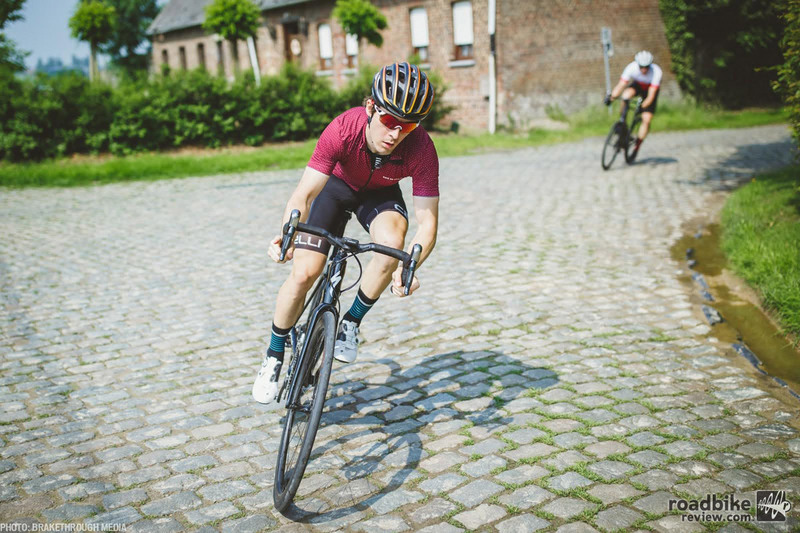 But the Roubaix has proven, time and time again, that the traditional concept of a road bike is far too one-dimensional to be fast in all conditions. The tried-and-true Roubaix has been ridden to victory in the fabled cobbled classics many, many times over the years, most notably by Belgium’s Tom Boonen, one of the best classics riders of all time. 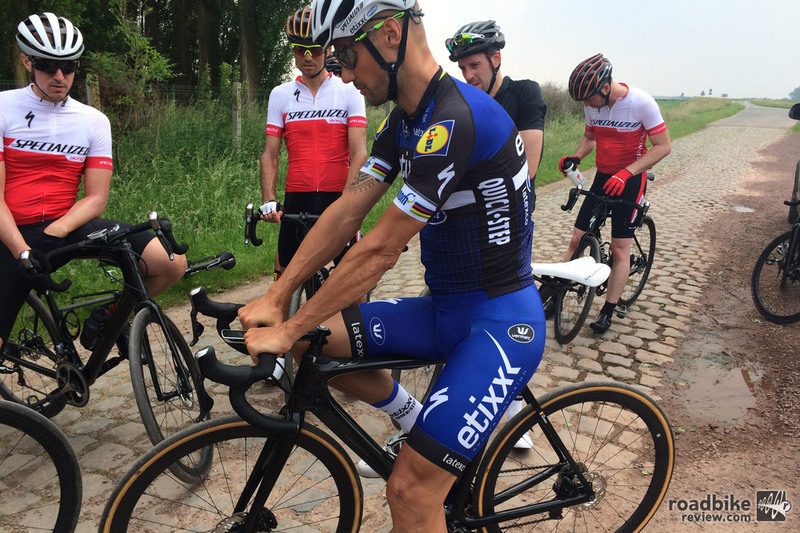 Fittingly, Boonen joined in on one of our test rides to answer questions about the bike that he and his Etixx-QuickStep teammates will be competing on next season. Tom Boonen of Etixx-QuickStep demonstrating the goods. Compliance is precisely what is needed in wheel-driven sports, across the board. How fitting that McLaren should be the one to convince the stubborn traditionalists of the cycling world that the same concepts of compliance apply to a bicycle as they do to a car. 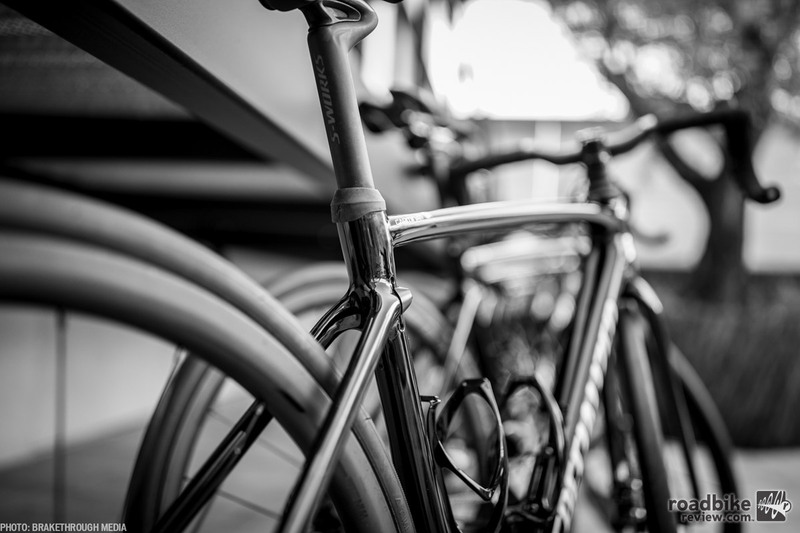 With the new Roubaix, Specialized has taken the mantra, “smoother is faster” to a new level. The Roubaix at home on the cobbles. Not all compliance is created equal, though. Axial compliance (the vertical sort), comes at a huge advantage to splay compliance (the horizontal sort). Specialized tested both along with all of the critical performance metrics. 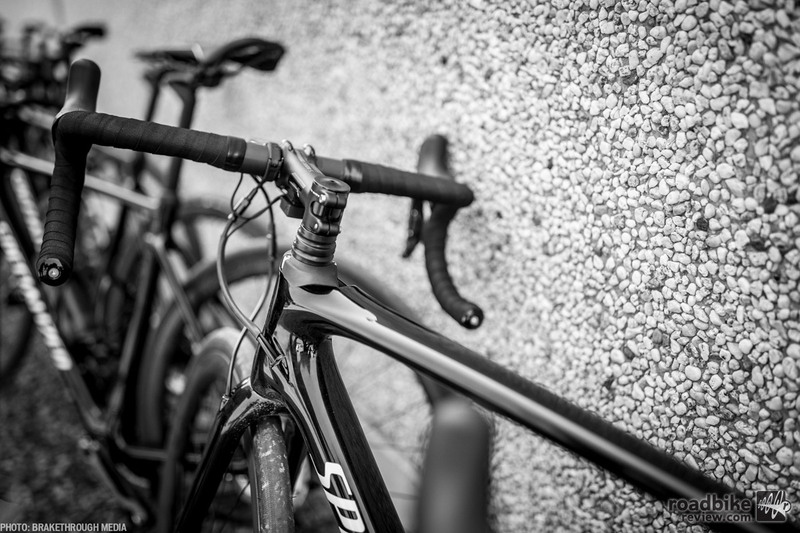 And while splay was shown to result in comfort gains for the rider, vertical compliance offers many of the same metrics for comfort but is “off the charts” in regards to offering measurable performance gains. Thus the futureshock, the star in the new Roubaix’s design. This key feature is offered as a replaceable spring-loaded cartridge, offering 20mm of travel above the head tube. The futureshock, combined with the Specialized CGR seatpost and more minor developments in the rear-end of the bike, makes for a 5.1% gain in vertical compliance compared to the SL4 Roubaix and other competitors in this category (including Trek’s Domane), claims Specialized. This equates to a more comfortable ride and what Specialized is claiming to be 3 seconds of time savings at all fitness levels over 40km. The new frame is the lightest Specialized has ever built, despite the fact that it’s built to perform in far rougher conditions than most of its predecessors. This is due to advancements in carbon technology and layup. The bike’s futureshock system weighs 290 grams, enough to tip the scales in excess of the previous iteration of this bike, but just barely. Total system weight (frame, fork, and futureshock) is up 16g over the SL4 iteration. This makes for an acceptable margin considering the incredible advancements in performance we see with this new model. Dillon Caldwell is a native of Bend, Oregon with a big heart for the sport of cycling. He grew up to be a successful junior cross-country racer but got hooked on road racing during his time at the University of Oregon, where he ran the school's club cycling team for several years. He now spends the majority of his time as a road racer for both the Audi and the Canyon Bicycles - Shimano racing teams on the regional and the national scales, respectively. On the side, he is a mountain bike tour guide for Cog Wild, a cycling coach for Wenzel Coaching, a member of the board of directors for the Tour des Chutes cancer charity, and a passionate writer. I had a chance to test ride the new Roubaix. Everything they are saying is true. It was extremely comfortable and soaked up all the bumps.Sprinting did feel different but it was still fast. Purchased the 2017 Rbaix in Sept. Very smooth ride, went looking for rough pavement was not disappointed. Put the stiff springs in the shock and barely notice any movement of the bar under normal power. Power transfer and cornering are on par with the Tarmac which now share geometry (except head tube height).